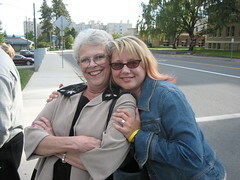 We drove to Coeur d’Alene, Idaho Friday morning to attend Gay’s brother’s wedding. Because of Ouzo’s unexpected surgery, we decided to take the dogs with us. We were surprised to find that both hotels we booked weeks ago accepted dogs. One charged $50 extra and the other took a $150 deposit. Pretty fair, considering we have two big dogs. 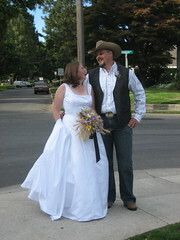 We checked into the hotel in Coeur d’Alene, got changed and went to the Hitching Post up the street. The ceremony was very short, I took a 7-minute video on my camera of almost the whole thing. We then met at The Coeur D’Alene, the resort at the lake, for drinks before dinner. We had dinner at a Chinese restaurant down the street. Gay’s father and his sisters drove from Spokane Saturday morning to meet us for breakfast. When Gay was a kid, her father took her to the lake to go boating quite a bit. We drove back to Spokane and we all went to the Arbor Crest winery in Spokane (who knew Spokane had wineries?!) and tasted some wines. We left Gay’s dad and aunts and went to Gay’s mom’s farm, north of Spokane. 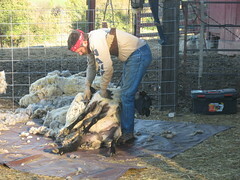 We spent the afternoon there and even got to see their sheep get sheared. 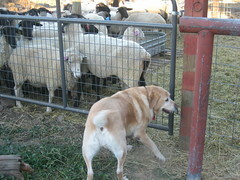 Illy and Ouzo pretended to be herding the sheep.. anytime the sheep got close to the fence, Illy and Ouzo would bark at them and make them run to the other side of the pen. We were tired by then and just wanted to get to our hotel in Spokane and get some dinner. So we dropped the car with the valet, with the dogs inside, and went to dinner at the hotel restaurant. We didn’t want to leave the dogs in the room for fear they’d bark the entire time and disturb the other guests, so they got to sit in the parking garage. The valet was very nice, and very brave considering that they bark like crazy when they’re scared. Illy does not like elevators, especially ones with slippery floors, so it was always a struggle to get her on the elevators at hotels. She would dig her claws into the carpet outside the elevator and refuse to get on, so I had to push her on while Gay pulled her with the leash. Overall, Illy did not have a fun time traveling (except at the farm), but Ouzo adapted well to it.